Directors' Duties: Principles and Application outlines key fiduciary and statutory duties of Australian company directors, with detailed reference to the position in the United Kingdom. It is addressed to academics, students and practitioners and resolves complex issues, as well as giving practical guidance on the characteristics and application of general law and statutory duties. In so doing it provides critical analysis of the scope and content of fiduciary duties in general and resolves a patent clash between prevalent modern equity theory and Australian corporate law jurisprudence as concerns directors' duties. Particular focus is given to the duties that have traditionally been characterised as fiduciary. These are the duties to avoid conflicts and profits, to act in good faith in the interests of the company and for proper purposes, to retain discretions and to disclose information. The duty of care is also examined and the book demonstrates why this duty is different to other key duties. This issue has been the subject of contention and is significant for remedial purposes. The book demonstrates the central and foundational nature of the duty to act in good faith in the interests of the company. The book also outlines the statutory duties in the Corporations Act 2001 (Cth) which correspond to the general law duties, as well as the consequences of breach of the statutory and fiduciary duties of directors and the significance of fiduciary classification. Extensive examination of the position in the United Kingdom is provided, which is of direct relevance to the analysis of the Australian position and also to the interpretation of English law. The book therefore provides certainty for practitioners, academics and students in the organisation and application of key directors' duties, presenting a clear structure for such organisation and application. Its outline and resolution of the contours of the fiduciary concept are also of direct relevance to scholars and practitioners in the areas of Equity and Trusts. Dr Rosemary Teele Langford teaches and researches with the Faculty of Law, Monash University and the Melbourne Law School, University of Melbourne. She has a first class honours degree in Law from the University of Melbourne, as well as a Bachelor of Arts (majoring in French and German) and a PhD in law from Monash University. Rosemary is also a Barrister and Solicitor of the Supreme Court of Victoria and formerly practised with Allens Arthur Robinson (now Allens Linklaters). Rosemary lectures a number of subjects including Corporations Law, Principles of Corporations Law and Advanced Corporations Law. 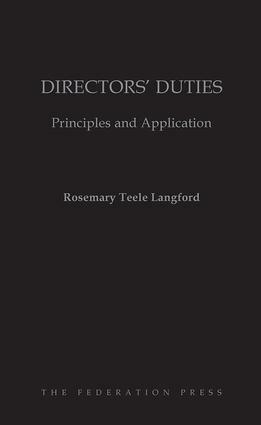 Her thesis centered on directorsâ€™ fiduciary duties and she has published widely on directorsâ€™ duties and fiduciary duties. Rosemary edits the directorsâ€™ duties section of the Company & Securities Law Journal. She has a particular interest in comparative research and work on this book was conducted in both Australia and Europe.